Two years ago, a friend of mine got married and I bought a gift from their wedding gift website. Surprisingly, I received a "Thank You" card in the post. Inside the card it said: "Thank you so much for the gift." It made me feel good that my friend and his wife took their time to not only write a thank you card but they posted it. You may be wondering why I was surprised. Well, I was not used to the practice. Have I ever done something for someone and I expected the individual to say thank you but they never did? 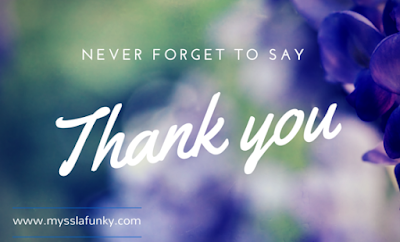 Are you someone that says thank you or do you feel too pompous to say thank you to those who have helped you? Do you know that Jesus expects us to give thanks at all times? A man once said after he went food shopping for his household and came back home, his wife said "thank you darling for taking your time to provide food for our family by going food shopping." The husband did not expect his wife to have said thank you as he felt it was his duty and role to not only provide the basic care but to assist in purchasing the food items. Nevertheless, the husband felt appreciated by the act of gratitude that his wife had shown to him. When last did you thank your spouse for their role at home? Create time today and thank your spouse, be specific about what you are thanking them for. You may be thinking that you do not mind if people do not show you gratitude after you have helped them. It does not negate the fact that you should say thank you to others when they have helped you. Who should you express thanks to? Express your thanksgiving to everyone whether the person is younger than you, older than you or whether they are your junior or senior at work or school. Saying thank you should also not be based on age, social status and title. Like many of us that appreciate thanksgiving whether we expect it or not, Jesus Christ expects us to give thanks to God through Him (1 Thess 5:18). When last did you thank God? When last did you thank God for your job? For the breath of life? For the fact that you can eat, drink, see, spend money and buy things? When last did you thank God for the beautiful flowers, trees and animals that you see? For your house? Parents? Children? For peace, for joy? For safety? All these things are not our entitlements, it is because God has chosen to shower us with these blessings. Whether you are a believer in Jesus Christ or a person who does not even believe in Jesus Christ, the fact that you are alive is only possible because of Jesus Christ. It is only God through Jesus Christ that can bless you with wonderful blessings; we must therefore not be oblivious to His blessings. There's a story of the ten lepers in the bible that Jesus Christ healed. Leprosy was not only a horrible skin disease, the social stigma of having it led to misery during the ancient Israel. In fact, historians made us understand that in the olden days, lepers were treated like dead people and castigated. One day, Jesus was walking through a town in Jerusalem, He saw a group of ten lepers, they stood far away from Him and called to Him, "Jesus, Master, have mercy on us." They must have known who Jesus was and the power that He had to heal. When Jesus heard them, He called back to the lepers and said, "Go, show yourself to the priest." As the lepers went on their way to see the priest, they looked at their skin and the leprosy was gone. Jesus, the greatest healer had healed their disease! They were so happy that they ran up and down the streets singing and dancing. Only one of them went back to thank Jesus for healing him. Jesus was quite surprised that only one leper came back to say thank you. Jesus said to him: "Weren't there ten who were healed? Where are the other nine?" Are you going to be part of the nine lepers that forgot to say "Thank You?" Or would you be like the only leper that came back to thank God? Now, give thanks to God. Thank Him for what He is doing for you, what He will do and what He has done. Holy Spirit, please help me to remember to give thanks to you every day for all that you do for me. Lord, let me also remember to express my gratitude to people that help me in Jesus' name. Amen.